We are a local, diversified real estate firm providing the best property management and maintenance services for homes, apartments, and HOAs in the Tamarindo and greater areas. Our success has been built on the tenets of trust, honesty and integrity. We believe that by first helping you succeed with your rental property management needs that we will then share in that success. At 1st Choice Realty we pride ourselves in offering the very best in residential and commercial property management services for the local and greater Tamarindo area. Our goal is to present a comprehensive suite of services that can be customized to fit the needs of the clientele we serve. And services we don't provide we hope can be filled by our business partners. And we aren't just stopping there! We are continuing to rethink and reinvent conventional residential property management. We are constantly bringing new services into the mix and gaining new efficiencies to enhance our clients' experience and save them money. In the greater Tamarindo area, there is no other company providing residential property management services that can match our vast offering of services, our dedication to our clients, and unrelenting customer service! Whether it is a tenant turnover, remodel, complete rehab, or just a general construction project, we are geared up to help you design, build, and complete your project. We have on staff a team of competent craftsman who build things all day every day. And we don't just limit our construction and maintenance services to our clients. If you have a maintenance project you want taken care of — fromfixing a deck to remodeling a kitchen, let us know and we will team up with you to "get 'er done"! You don't even have to own a rental! • Offer recommendations on repairs and cosmetic improvements that maximize monthly rent while providing good ROI. • Gather data on rental rates in the area and work with owners to determine the optimal rental rate. Rent research will vary, but should include looking at the recently rented comparables according to size and type. • Discuss with owners the pros and cons of different policies such as accepting pets, allowing smoking etc. • Meet prospective tenants for showings throughout the week and weekend. • Perform a background check to verify identity, income, credit history, rental history, etc. 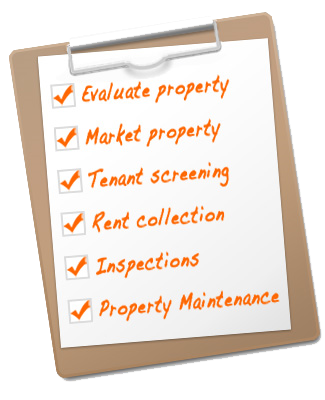 • Perform detailed move in inspection with tenant and have tenants sign a report verifying the condition of the property prior to move-in. • Understand and abide by the latest local, state and federal legislation that apply to renting and maintaining rental properties. • Perform periodic inspections (Inside and outside) on a predefined schedule looking for repair needs, safety hazards, code violations, lease violations, etc. • Provide an network of licensed, bonded and fully insured contractors who have been vetted for good pricing and good work that is up to code. • Assign jobs to different parties (in-house employees, handyman and professional contractors) based on who will do the best job for the best price. o Provide recommendations on how the project can maximize rental income. • Forward any portion of the owner’s portion of the tenant deposit to the owner or hold in owner reserves for repairs.